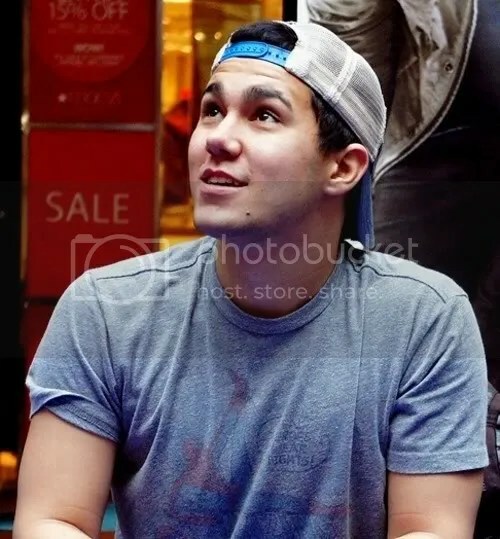 Tag Archives: Carlos Pena Jr.
Talk to any member of online BTR fandom and chances are they’ll tell you that the boys of BTR have rooned their life. Once you fall in love with this incredible quartet there’s no going back, so I give you fair warning: if you don’t want to sacrifice even more of your free time to online fanning you may want to turn away now. You’ll be missing out on something amazing, but I couldn’t blame you. I’m going to do my best to describe what makes each of these boys so amazing, in real life and as the characters they portray on their show. James Maslow is probably the best singer in the group. He has a background in choral and operatic training and he can pull off vocal gymnastics that I just did not expect from a pop group. He is very sweet in interviews, though to be honest I don’t find him as dynamic as the other three and he’s the one I know the least about. I can say that he’s very genuine in interviews but doesn’t seem to have the ease and humor that Carlos, Logan, and Kendall do when in front of the camera. In a way, I respect that though because that’s probably how I’d be. I tend to be exuberant when around my friends but in public or with people with whom I’m not close I get very reserved and polite. I think James is similar because when he talks with the other guys (especially when they mistakenly think they aren’t being recorded) he loosens up a lot and cracks jokes. James’ character on the show is shallow and self-obsessed. It is his dream of becoming a pop star which sets the whole show in motion. Frankly, I don’t much like James Diamond and I’m sure this leads to my disconnect with James Maslow. I know they’re different people but disliking his character, though not making me dislike the performer, has made me less interested in learning more about the actor. James has grown significantly more layered as the show has progressed, however. Alright, it’s time to talk about one of my favorite things in the world, and that is the wonderful world of Big Time Rush. I’ve posted things related to them here before, like featuring Carlos as my last Web Crush, but haven’t worked up the nerve to talk about the whole band and everything I love about them. Ooh, I’m getting excited just at the prospect of talking about these guys and their show and their music and how much I love them. Truth be told, I’m a bit nervous too. There’s so much hate for entertainment aimed at teens/tweens, especially the music which aims for that demographic, that I worry people will write off these fantastic guys just for being a Nickelodeon band without giving them a second glance. So I ask you to give them a chance, to ignore that voice in your head saying “Look at these over-produced, auto-tuned, mass-marketed punks” and open up to the possibility that they are more than they seem. Because they are more than they seem. They are so much more. Big Time Rush was conceived by Nickelodeon to be The Monkees for the new millennium: a television show about a band and an actual band that makes pop music. The casting process took around two years I believe as the producers searched for the right combination of singer/actors who would work well together as a group and appeal to the right demographic. Not only did they achieve this, but I think it’s safe to say these four young men gelled better than anyone could have imagined. The four band members are James Maslow, Carlos Pena Jr., Logan Henderson, and Kendall Schmidt. James, Carlos, and Logan had been selected for a while before the fourth spot was finally filled by Kendall and he has been described as the last piece of the puzzle which finally fell into place. Despite being the last to join the group even after others had been tried in his role he became the instant fit and all involved knew that they had gotten the group right. Seeing how these four interact and speak so highly of each other is frankly beautiful. In a world where machismo is so valued and male friends are not exactly encouraged to be affectionate with each other it’s incredible to see these four so unafraid of hugging, sharing private jokes, and using the words “love” and “family” to describe their bond. This incredible chemistry is a huge part of what makes their show such a joy to watch. It’s rare to see a group of males whose friendship is the focus of a television show. I don’t mean that there are no male friendships on TV, but I seem to see it always being two friends, usually a girl or two thrown into the mix for romantic tension, and the focus of the show is usually outside of their relationship with each other; the fact that they’re friends merely an accepted fact of the show and not its main thrust. This is not the case with “Big Time Rush”. The four boys share a bond which is celebrated, tested, damaged, and mended but never broken. While there are love interests and romantic story arcs it is this incredible bond of friendship which is the heart of the show. Also on the show we see some amazing things which are almost never a part of teen/tween shows: ongoing story arcs, character development, parents who aren’t utter failures, consequences for careless/selfish behavior, and incredible role models for both girls and boys. To be sure, these are not heavily emphasized aspects of the show and over-the-top antics and slapstick humor are much more apparent, but seeing what drives the story behind those gimmicks is so rewarding, and after all, isn’t that the point of being a geek? Looking deeper than the surface appearance of something, obsessing over the details, and appreciating the nuanced heart of the matter? So this is my brief introduction to the world of BTR. Look forward to posts expanding on the ideas I’ve touched on here and further celebrating these guys and all they’ve built. I’m excited to share my love for them with you! Web Crush Wednesdays: Carlos Pena Jr. I am beyond excited to talk about this week’s Web Crush, a certain wonderful member of a boy band with which I may or may not be completely obsessed: Carlos Pena Jr. of Big Time Rush. Carlos is such an open and exuberant human being. He has a joy for life that is beautiful and a love for his fans that is really heartwarming. All of the BTR guys are responsive to fans and appreciative of them (or should I say “us”?) but I feel Carlos is possibly the most open and present online. He’s constantly tweeting updates on things like filming, rehearsals, or even vacations and his youtube channel is full of behind-the-scenes videos and ways to interact with and include fans in his career and even his personal life. It’s something he doesn’t have to do, but he chooses to do so to let us experience as much as we can about the band and what they do and I love him for it. He could easily spend his free time resting or letting off steam but instead he uses it to make sure the fans are being included in what’s going on and kept abreast of any news. When he first opened his youtube channel he started doing these fan e-mail videos every Friday. He didn’t keep up with this schedule for too long but I understand he’s got a crazy schedule and overwhelming amount of e-mails. I hope he’ll go back to them eventually, maybe after the summer tour finishes and he gets a chance to breathe, but if he doesn’t it’s definitely not something I’ll hold against him. He does enough for the fans! I love seeing the guys messing around while filming. “Big Time Rush” honestly seems like the most fun show to work on and that joy definitely comes through in the episodes. The cast’s chemistry shines and makes an already good show that much better. Yes, the video which made “Call Me Maybe” a hit! Now, I’m not delusional. I know the reason this video blew up and had more hits than the official video was because of Justin Bieber and probably to a lesser extent Selena Gomez being in it, but it was still Carlos’ work and I want to give him the credit he deserves for putting it together. Plus I just love it! I love seeing these celebrities letting their hair down and just having fun with each other. Makes them seem so much more real. He doesn’t just share the joy, though. He opens up and is honest with whatever is happening in his life, including his breakup with his girlfriend Samantha Droke. Again, I want to emphasize that he does not need to do this but is willing to put himself out there in the interest of transparency with his fans, to let us know where he is mentally, emotionally, etc. I love that he also encourages the fans to be supportive not only of him, but of his ex as well. While I do believe the BTR fandom is overall a loving and generous one, it’s true that many react negatively whenever the guys are romantically linked with someone and he shows his maturity and sensibility by trying to diffuse the potential hatestorm that could be sent Samantha’s way. I am really impressed by this. It’s creative, well done, and I just marvel over how labor-intensive! He and Rachel worked very hard on this and I think it paid off with a beautiful finished product, worthy of the beautiful song which I probably wouldn’t have heard had Carlos not promoted it. I really just find Carlos to be a spectacular human being. He’s loving, loving, and loving. He loves his family, his friends, his fans, and he is never hesitant to show that love. If you’d like to share in the joy he spreads, I suggest you subscribe to his youtube and follow his twitter. Beautiful. Happy Fourth of July everyone! Posted in Internet, videos, Web Crush Wednesdays	| Tagged Big Time Rush, Carlos Pena Jr.
I’ve never heard this song before but I can’t stop listening to it now and I love this video so much that I’m still sitting here with a goofy smile on my face after watching it three times in the last hour and a half. It’s basically a random assortment of tweendom stars from Disney Channel, Nickelodeon, and mainstream music just dancing around and having fun and while I know that probably doesn’t appeal to a great number of folks who frequent this blog it is something that I adore and want to share. As I mentioned, the video was posted by Carlos Pena Jr. who is one of the four members of the band Big Time Rush which I am sure to post about many, many times in the future. (That list of post ideas I mentioned? Twelve of them are related to BTR) I won’t gush about Carlos too much here but I will say that he’s the most adorable, friendly, and genuine celebrity I know of and nothing makes me happier than seeing him post a new video. Kendall Schmidt, Logan Henderson, and Dustin Belt (DBelt isn’t an official member of the band but he used to be in a band with Kendall and has become BTR’s most featured musician) are the other Rushers present in this video, the only member missing being James Maslow. From the Disney Channel troupe we’ve got Ashley Tisdale of ‘High School Musical’, Moises Arias of various featured roles, and Selena Gomez of “Wizards of Waverly Place”. The biggest star here though is obviously Justin Bieber who I have to say I really like. Not so much his music because I haven’t listened to much of it (I love “Never Say Never” though) but more of how positive a role model I think he is for kids and as an educator that really is something that I value. So please watch and enjoy! If for nothing other than the fact that it’s fun.